Historic fiction is one of the many genres I enjoy and this month, I am enthralled to invite author Rosemary Noble to be a guest on my Blog. Rosemary is one of many writers in West Sussex I have met and networked with over the years as a result of CHINDI (Celebrating and Helping Indy Authors). Last year she completed her ‘Currency Girls’ Trilogy, so it is my pleasure to introduce her and find out what lies at the heart of her writing. Hello, Rosemary and may I start by asking when you first started writing? I wrote my first book in my teens and then nothing until I retired. It wasn’t even in my retirement plan. I’m still amazed that I have four books written in five years. The problem is that it’s rather taken over. I need to give myself and my husband a break. He’s getting fed up that I’m so busy. What made you choose historical fiction as your genre? I’ve always love history. If my A levels had been good enough in the 60s, I would have studied history at university. But now I have the opportunity to indulge my love with something creative too – the best of all worlds. That sounds wonderful. Can you describe your novels in 10 words? Gritty family sagas, real people leading extraordinary and interesting lives. Just the sort of stuff I like to read, which leads me to my next question. When and where you prefer to do your writing? I like an early start. Sometimes the ideas come to me when I’m trying to sleep (always annoying) but it means I’m itching to get going not long after dawn. I write in a comfortable chair, with the laptop on my knees. Same here, I’m an early riser and instead of lying in bed thinking, we might as well be writing it down instead. Where did you get your ideas from? Family history – simple as that. I like to research the social conditions of the time and that provides me with the settings and framework for the stories. That is so inspiring – so are your characters based on real people or people you know? So far, they have been based on real people with other supportive made-up characters. The made-up ones are totally imaginative and that means you can make them whatever you want them to be. I had fun in my latest book making a couple of characters quite dark. Sometimes they write themselves, like Sarah, in Search for the Light. Everyone else in the book is in the third person, but she wanted to tell her story in the first person. I was happy to let her. Writing in first person is quite different isn’t it? The character has more voice. With this in mind, who is your favourite author? That is the most difficult question. I have several favourites. I always look for any new books by Sebastian Barry; Rose Tremain; Tracey Chevalier and Margaret Atwood. I have heard of Rose Tremain, as she is quite famous isn’t she? Following on from that, what is your all time favourite book and why? Probably Poisonwood Bible by Barabara Kingsolver. It was the first time I had come across a book with some many different and distinct voices. It’s the story of an American Missionary with his family in Africa. It’s narrated by each daughter as the family descends into the chaos caused by the father’s hubris and their government’s duplicity. That sounds like an intriguing story. But going back to your own books, How much research do you need to do? Lots. I have written three books set in the nineteenth century, so I read contemporary accounts often freely available on Google Books. I use a lot of newspapers too, occasionally historical journals and the internet, of course, but that I take with a pinch of salt Sometimes I need to visit libraries and museums, specific to the setting. Some local newspapers are still not on-line in the UK. I guess it is essential to get it right when writing historic fiction. Just imagine if one or more of your stories were made into films. Who would you like to see playing the lead character in your book and why? In my new book I would choose Sarah Wiseman who played Carolyn Bligh in A Place to Call Home. My husband and I loved the series. He found it by serendipity and then we couldn’t stop watching it. It’s a fascinating representation of the land-owning class in 1950’s Australia, as well as being a great story. Sounds good. With this in mind, do you work out a strict plot or just start writing? I have a framework. I know I have to get from A-B via C. However, I also like to see where the writing takes me. For me, that’s a lot more interesting and exciting. What’s the best advice about writing you were ever given? And lastly, what are your future plans for writing and what are you working on now? My eight-year-old granddaughter is desperate for me to write a children’s book. I have one lined up ready to write. She gave me the time-frame and the names of the characters. We brain-stormed a few ideas and then one night the plot came to me around midnight and by three, it was all planned out. Something quite different then. I can imagine that will be a lovely new challenge for you and look forward to seeing the end result. Best of luck, Rosemary, this has been a really interesting chat. 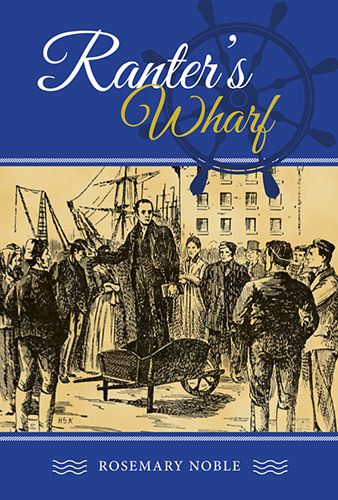 To conclude, I have read one of Rosemary’s books, Ranter’s Wharf and was completely engrossed in the story as well as learning about a piece of history I didn’t know. For further information about Rosemary, you can read her biography below, connect with her via her social networks and check out her author’s page on Amazon, which also lists her books. Rosemary Noble lives in West Sussex and worked as an education librarian. Books have been her life, ever since she walked into a library at five-years-old and found a treasure trove. Her other love is social history. She got hooked on family history before retirement and discovered so many stories that deserved to be told. 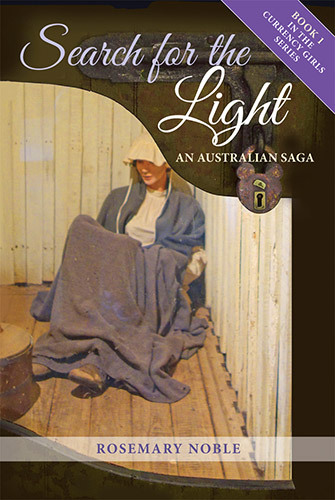 Her first book, Search for the Light, tells the story of three young girls transported to Australia in 1824. Friendship sustains them through the horrors of the journey and their enforced service in Tasmania. 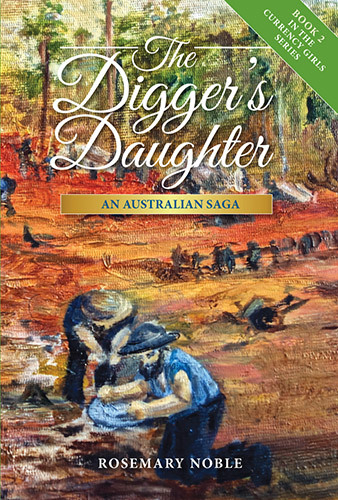 The Digger’s Daughter tells of the next generation of gold-diggers and a pioneering woman who lives almost through the first hundred years in Victoria. The third in the trilogy, Sadie’s Wars takes the reader to the fourth generation and into the twentieth century. The trilogy is based on the author’s family. It tells of secrecy and lies, of determination and grit and how all can be done or undone by luck. 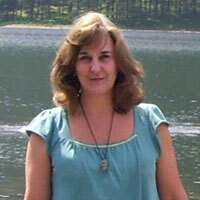 Rosemary is a member of CHINDI independent authors and is involved in literary events in and around Chichester. She also loves to travel, especially to Australia and Europe and not least, she loves spending time with her grandchildren, one of whom is a budding author herself. 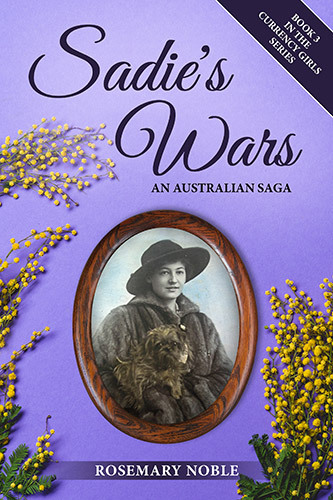 This entry was posted in Guest Posts, Social History, Writing and tagged Australia, Australian history, author, books, Chindi Author of the Week, family saga, Historic Fiction, history, novel, research, Rosemary Noble, writing. Bookmark the permalink.